John Paul Jones is more than a great sea story. Jones is a character for the ages. John Adams called him the 'most ambitious and intriguing officer in the American Navy.' The renewed interest in the Founding Fathers reminds us of the great men who made this country, but John Paul Jones teaches us that it took fighters as well as thinkers, men driven by dreams of personal glory as well as high-minded principle to break free of the past and start a new world. Jones's spirit was classically American. Evan Thomas brings his skills as a biographer to this complex, protean figure whose life and rise are both thrilling as a tale of dauntless courage and revealing about the birth of a nation. I really enjoyed learning about this often forgotten Revolutionary War hero. Jones' obsessios with "honor" and "class" certainly also instructs on 18th century values. This selection has prompted me to want to know more about this complex man. 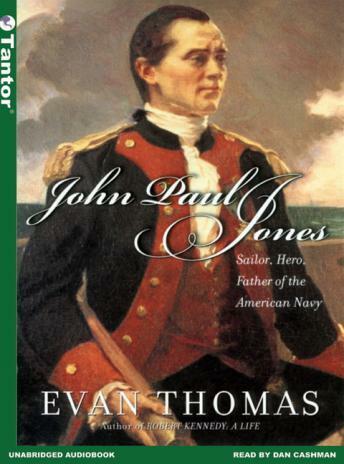 This was a well written book about John Paul Jones and his life and times. I do wish the author had not constantly represented J.P.J. as a disappointed and ignored hero. I simply became tired of hearing about Jones’s unhappy situation due to his “lack of recognition”. If it bothers you, be prepared to fast forward.